Sure, drinking in airports and on planes is sometimes a bad idea, but more often than not it's kinda the best. That said, have you ever put down your drink mid-flight to wonder why the flight attendant never IDs you, but the bartender at your local watering hole does? Or why that rowdy group of underage college kids seems to be getting a head start on spring break? Liquor laws on the ground are complex enough, but in the air, well, they're no more straightforward. Which is why we chatted with both flight attendants and airline officials in a mad attempt to understand the rules that govern airplane booze. So, what’s the legal drinking age on planes? Basically, the FAA has no rules covering the serving of alcohol, so it’s up to the individual airlines. Most adhere to the laws of the country in which the airline is registered, while others to the laws of the country from which the plane is departing. Still, others observe the destination country's rules. Yea, you can see why this is a confusing mess. As long as the plane is on the ground, though, local laws usually apply. What do you mean by "where the airline is registered"? Pretty much what it sounds like -- airlines are based in certain countries and thus, registered there. As it applies to booze, say you're flying from France to the United States on Lufthansa, a German airline that's registered in, you guessed it, Germany. As soon as the doors close, you’re technically “in Germany” and thus able to drink beer and wine at age 16. Those crazy Germans. Like with gambling in "international waters," is there such a thing as "international airspace"? Sort of. Airspace is controlled by the country it's above, but when it comes to booze, all space is pretty much "international." 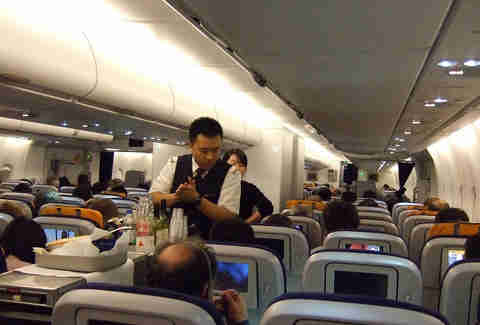 For example, a western carrier flying into Kuwait -- a non-alcohol country -- can serve drinks right up until touchdown. On its way out, only once airborne. Why don't flight attendants check ID? Maybe you’ve been lucky, maybe they just DGAF, but generally flight attendants SHOULD be checking IDs, and are trained to do so. That said, it really just depends on the flight attendant, so maybe bring them some chocolates. While the airlines all claim not to adhere to an individual state's blue laws, one US-based flight attendant noted that they can't/don't serve pre-departure drinks in first or business class in a handful of areas that prohibit drinking alcohol before noon on Sundays. She also said there are a few states in which she can’t serve liquor until after takeoff on election day. Which, obviously, makes no sense at all since nobody's getting OFF the plane to go vote. What if I want to BYOB? Again, this depends on individual airline policies. 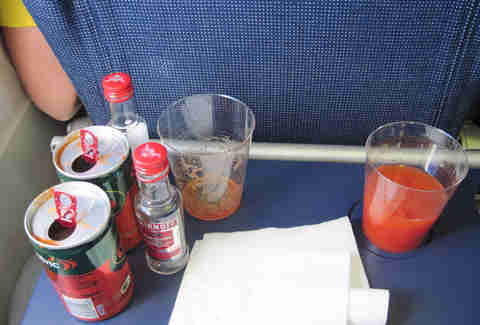 Legally, any passenger in the United States can bring alcohol on a plane (please click here before claiming otherwise in the comments), but most airlines prohibit passengers from drinking it onboard. 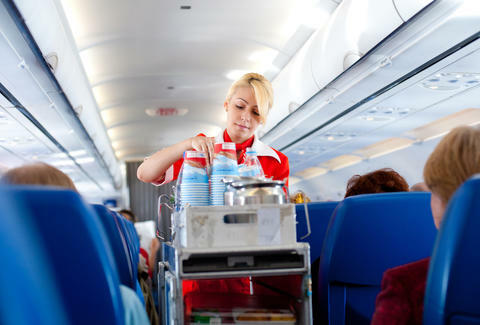 Some, however, do let passengers imbibe their own booze, so long as the bottle remains in the galley, and it's served by a flight attendant.